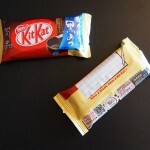 Review: Kit Kat Kuro Mitsu (Black Honey) | Oyatsu Break! 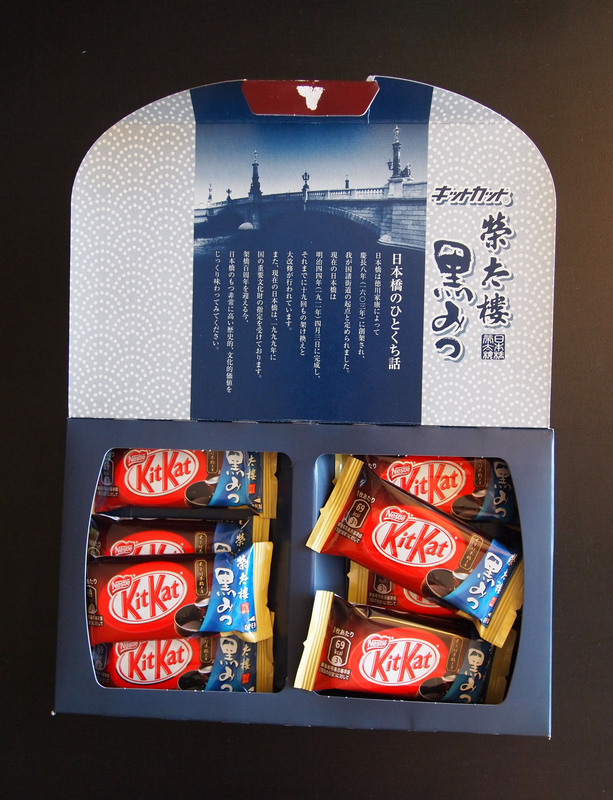 This is one of the newest limited edition, giftset flavours of Kit Kat that was released just before my last trip to Japan in the fall of 2011. It’s a very Japanese flavour, I’d actually never heard of Kuro Mitsu before and just now I did a bit research. As noted above, the direct translation is “Black Honey” but it actually has nothing at all to do with honey-from-bees honey. It’s a sugar syrup that’s similar to molasses, made of an unrefined black sugar, though apparently it’s got a milder flavour. It’s always a little difficult when trying a specific sort of flavoured candy, if you’ve never tried the thing it’s supposed to be flavoured like. 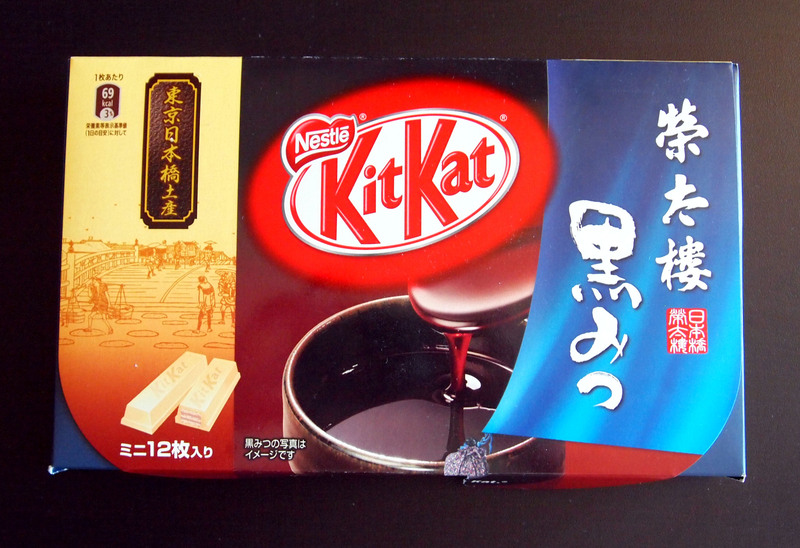 But luckily, candy is generally delicious whether you’re familiar with the flavour or not! Packaging: Classsssssssy! 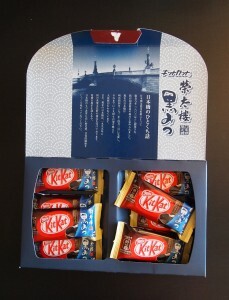 The exterior of this particular gift set screams “I went to Tokyo and I got you the classiest limited edition Tokyo Kit Kat I could find!” It’s got one of the many famous bridges around Tokyo that were used as trade routes in and out of the city depicted on the exterior as an Ukiyo-e style drawing, and on the interior as a photograph (I have no idea which bridge, sorry!). A stoneware pot on the exterior with a spoon drizzling kuromitsu is framed by an illustration of a royal blue piece of cloth. 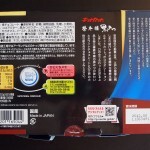 The back and interior feature tons of information that is unfortunately (for me) in Japanese. This would be a great looking gift to get someone in Japan, or a great souvenir of Japan so long as you didn’t want to know anything at all about the origins of the product…! Scent: Surprisingly for a white chocolate Kit Kat, the scent isn’t of white chocolate! The scent is fairly sweet, but with a different sort of hook. It has a deeper note, like molassess or maybe maple syrup, definitely something more complex than usual. 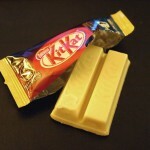 Taste: Consistantly with the smell, this is a really interesting take on a Kit Kat. 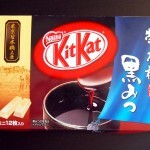 If I had to pick a Kit Kat that it tasted most like, I might actually say Soy Sauce, since I find the Soy Sauce Kit Kat to be very sweet, with very little shio flavour, but something approaching a maple note (this has been corroborated by most the Canadians I’ve shared Soy Sauce Kit Kats with ;). The more I have of them though, the more I realize that there aren’t any real maple notes, and it’s more of that deep sugary/syrupy taste. At first when I thought these were made of some actual sort of Japanese honey, I assumed that’s what it was… It certainly does have a more complicated honey-type sweetness than a straight-ahead sugar syrup. But as kuro mitsu is made from the Japanese equivalent of muscavado, or unrefined brown sugar, I’d say that’s probably what gives it its unique flavour… but not having had it it’s tough to tell. 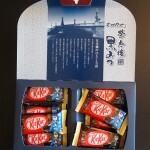 Make no mistake, this is a very sweet Kit Kat, but it’s a much more complicated sweetness than you would normally find. Verdict: I really like it! I’m kinda of surprised by how much too, since I’m not an avid honey/brown sugar person. 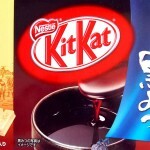 I think Nestle just found a flavour that compliments their standard Kit Kats very well, offering up a richer snack. It’s not all praise though, as realizing that changing the type of sweetness of the candy bar has me anxious for them to try more aggressive and unique flavours. Why not a burnt sugar kit kat? Or a burnt sugar and brown butter mix, something closer to a stovetop caramel and all of it’s wonderful flavour range, rather than what passes for commercial caramel. Heck, I just read the second issue of “Lucky Peach”, a food magazine, and it has a recipe for burnt miso butterscotch, and while I plan to make it any day now, can you imagine how wonderful and intense a flavour like that would be contained in a Japanese Kit Kat? Maybe they can make that one the exclusive “New York” regional variety?